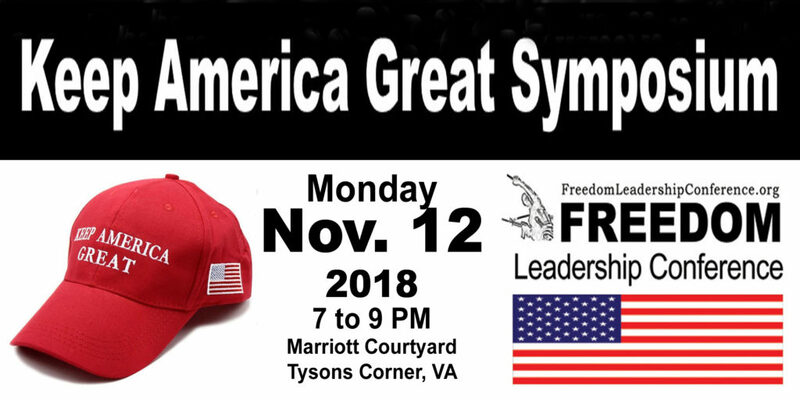 Americans for the Trump Agenda Sponsors “Winning the Battles of the 2nd Half of the First Term” Symposium at Freedom Leadership Conference at Marriott Courtyard this Monday, November 12 at 7 PM. Americans for the Trump Agenda has reserved 20 seats for northern Virginia area conservatives at a free Symposium to discuss “Winning the Battles of the 2nd Half of the First Term” at the Freedom Leadership Conference at the Marriott Courtyard this Monday, November 12 from 7 to 9 PM. Those invited will be expected to speak for a minimum of 1 minute and up to 10 minutes each on the subject of the conference (priority to those who write in advance, suggesting their topic and minutes requested, subject to advance approval). The extremely limited seating means admission is by confirmed attendees only. The Conference will also see the unveiling for the first time in norther Virginia, of the new, post November 6 slogan for Trump supporters with a limited number of the new and distinctive, “Keep America Great” baseball cap (although of course, your “Make America Great Again” cap is very welcome). Congressman Scott Perry presenting Ron Cohen with a “Chairman Emeritus| award after he had been given the “Statesman of the Year” Award of Conservative Christian Center in York, PA in 2017. Emy Delgaudio, its chairman, speaking at a Freedom Leadership Conference in 2017. (R) Dr. Ken Gibson speaking at the 2017 CCC Statesman of the Year Awards breakfast. All three will travel to the House Rayburn Bldg. on Tuesday to help make the case to their Congressman, Scott Perry (who has confirmed to attend), who will join them and their group for lunch. Co-Sponsored by United American Patriots and Uniformed Services League. U.S. 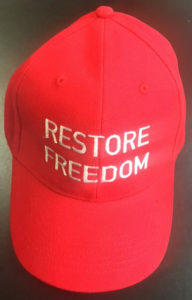 Congressman Scott Perry has joined with Congressmen Louie Gohmert and Duncan Hunter to attend the “Restore Freedom Day” Briefing of United American Patriots and Uniformed Services League on Tuesday, April 17 at the House Transportation and Infrastructure Hearing and Conference Suite, 2253 Rayburn House Office Bldg., 2nd Floor. Speaking at Lunch at the “Restore Freedom” Briefing at the House Rayburn Building co-sponsored by United American Patriots and Uniformed Services League, U.S. 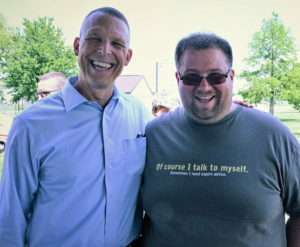 Congressman Scott Perry was the keynote speaker at the Conservative Christian Center 2017 “Heritage Fiesta” summer picnic, shown here with member of the York County CCC Board, Bob Cosgrove. 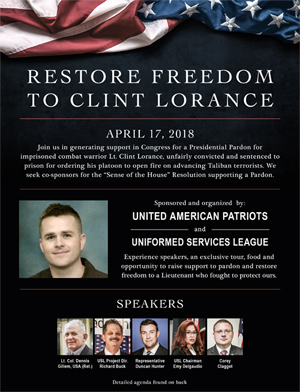 Congressman Perry will be briefed on why he is being asked to support a Presidential Pardon for Clint Lorance and other unfairly imprisoned combat soldiers by his own constituents, Ron Cohen, Dr. Ken Gibson and Emy Delgaudio. They are part of a group of 40 visitors including four of his own constituents who will be visiting Washington, DC to ask Congressman to endorse their call for a Presidential Pardon for Clint Lorance and others. U.S. 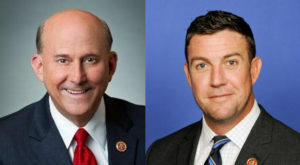 Congressmen Louie Gohmert (L) and Duncan Hunter, are the first to accept invitation to a briefing on Tues. 4/17 at the House Rayburn Bldg. Hearing Room #2253, to hear the case for a Presidential Pardon for Lt. Clint Lorance, sentenced to 19 years in prison for ordering his men to open fire on advancing Taliban terrorists in an Afghanistan combat zone. Co-sponsored by United American Patriots and Uniformed Services League. The American Army Lieutenant serving 19 years of prison for ordering his men to open fire on advancing Taliban terrorists in an Afghanistan combat zone under the Obama-era “rules of engagement” is getting some help this Tuesday. United States Congressman Duncan Hunter, himself a Marine combat veteran, has reserved a hearing room in the Rayburn Office Building of the U.S. House of Representatives for a 3 hour lunch and briefing for U.S. Congressman. Hunter and Representative Louie Gohmert are both slated to speak to attendees there along with at least another 3 to 8 Congressmen expected to confirm. More to the point, the co-sponsors of the event (who are paying all expenses), United American Patriots and Uniformed Services League, don’t just want the Congressmen who attend their briefing to listen. They want to hear them respond and find out if Congressmen will join their colleague, Rep. Duncan Hunter, in speaking out for and supporting a Presidential pardon for an Army officer who simply did his duty in combat and doesn’t deserve prison as his reward. 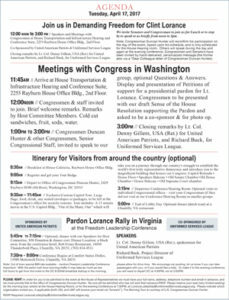 side 2 of the flyer – with the detailed itinerary for the entire day. The chief organizer of the Pennsylvania Leadership Conference sent a “video message” to conservatives in Virginia as to why they ought to attend functions such as his and the Freedom Leadership Conference this Thursday night, view the vid HERE or click on image above. Off Rt. 50 near Rt. 28 – 3940 Centerview Dr. The keynote speaker at the “Patriots’ Day” Celebration at the Freedom Leadership Conference sponsored by Gun Owners of America next Thursday night, is no stranger to conservative causes. 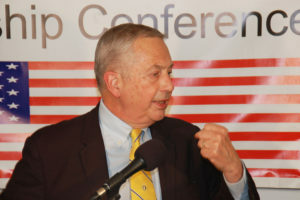 GOA Executive Director Emeritus Larry Pratt has been a past speaker at the conference and before conservative audiences from coast to coast for dozens of years. At the time serving as GOA Executive Director, Pratt spoke to an audience of nearly 100 at the Marco Polo Restaurant in Vienna, Virginia on May 15, 2013. But his remarks reached 2,579 more people when the recording was placed on youtube, click above or HERE. 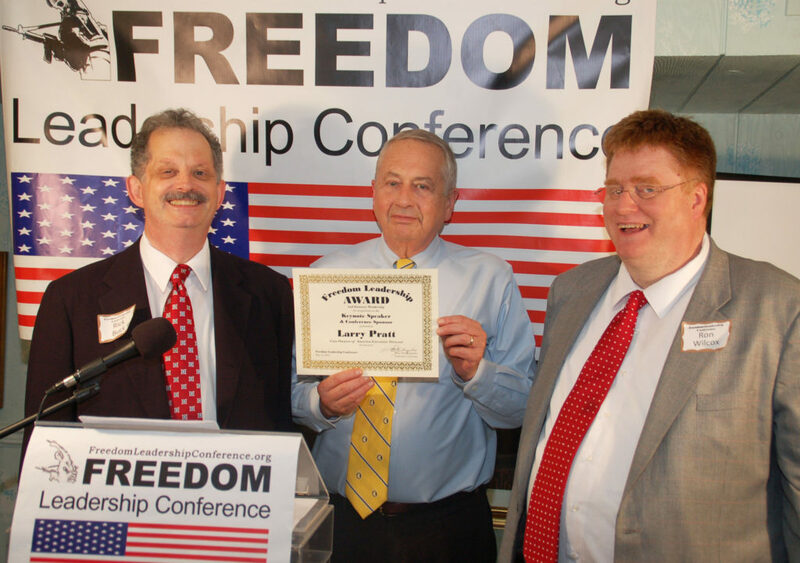 Keynote speaker Larry Pratt (center) being presented an appreciation award at the April 13, 2013 Freedom Leadership Conference by conference leaders Richard Buck (L) and Ronald Wilcox (R). Gun Owners of America is a sponsor of the Freedom Leadership Conference for the third time again with Larry Pratt, on Thurs. 4/20 in Chantilly, VA. 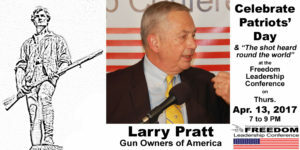 The “Celebration of Patriots’ Day” at the Freedom Leadership Conference featuring Larry Pratt delivering keynote remarks in behalf of sponsor Gun Owners of America has been postponed by one week until Thursday, April 20. This is actually the day following the official “Patriot’s Day” celebrated in Massachusetts and Maine. The conference runs 7 to 9 PM (doors open 6:30 PM) and requires advance registration HERE ($5 at the door). For those who want to have dinner with Larry and help pay for the conference, doors open 5 PM, dinner served 5:30 PM to 6:30 PM ($35 each, save $5 for a couple $65, save $5), register HERE. Chances are if you ask 10 Virginians about Patriots’ Day they will think you mean the movie, not the holiday officially celebrated only in Maine and Massachusetts, the April anniversary of the battles of Concord and Lexington which was the start of the American War of Independence. 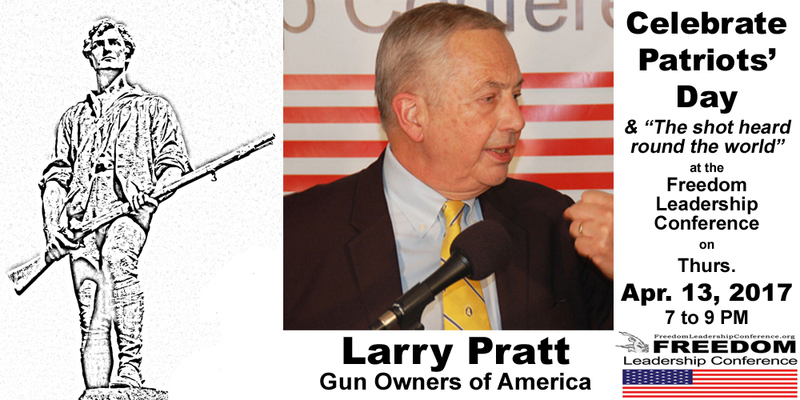 Larry Pratt returns to the Freedom Leadership Conference on Thursday, April 13 to celebrate Patriots’ Day. Pratt is the Executive Director of Gun Owners of America, a repeat conference sponsor. Join us in a celebration of Patriots Day on April 13, 2017 at the Freedom Leadership Conference, sponsored by Gun Owners of America and featuring an evening with Larry Pratt, their Executive Director Emeritus, on Thursday, April 13 at the Wingate by Wyndham Hotel in Chantilly, Virginia, conference at 7 PM, dinner at 5:30 PM, advance registration required, ultra-early bird pricing expires tomorrow night (Friday 3/31), for those ready to celebrate Patriots’ Day who reside in Virginia or within drive distance HERE. The logo of Gun Owners of America makes a perfect fit for the Patriots’ Day Celebration on April 13 at Freedom Leadership Conference. Patriots’ Day, celebrated the third Monday in April each year, commemorates the battles of Lexington and Concord in 1775, the start of the American War for Independence, with the “shot heard round the world. Paul Revere’s famous “midnight ride” was made famous (with some artistic license) by the poet Henry Wadsworth Longfellow.